I finally bit the bullet, if you’ll pardon the pun, and sank myself into bullet journaling. Never heard of it? Well, back in 2015 a digital product designer named Ryder Carroll came up with a simplified system of journaling to help himself stay organized. 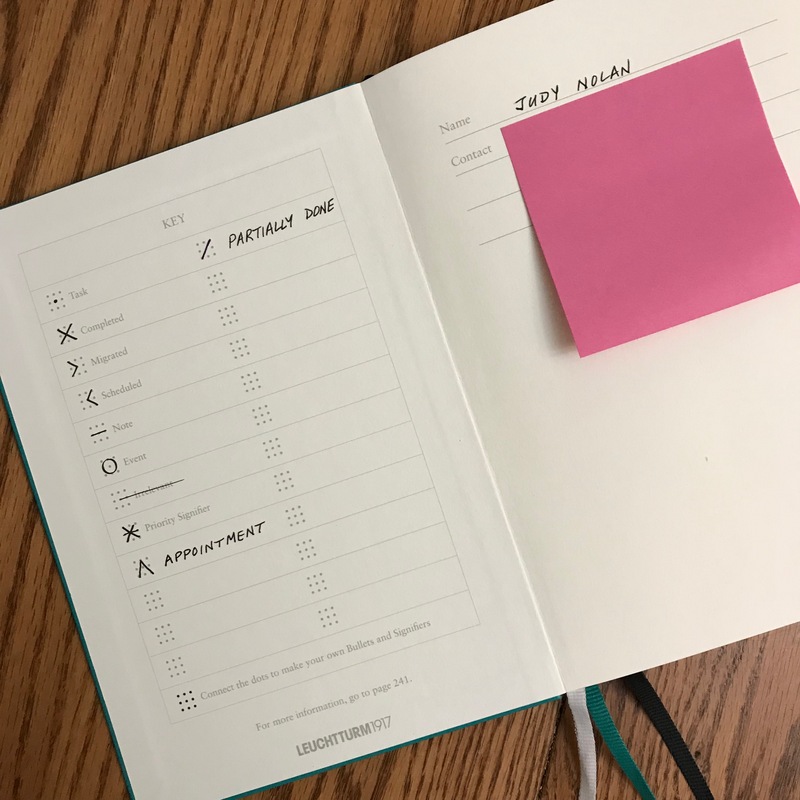 “The real goal,” he says in the Leuchtturm1917 journal he developed with the Leuchtturm publishing company, “is to develop a mindful practice that helps you identify and focus on the things that are truly worth your time.” His system, in its purest form, utilizes a notebook whose pages consist of dot grids. All you need is a notebook—any kind of notebook that works for you—and a pen. Four concepts form the foundation of his system: Rapid Logging, Collections, Migration and Indexing. Rapid Logging uses a system of customizable symbols called bullets to jot down tasks, events and notes in your journal. Collections are the way you group related entries. They can be anything you wish, but the core collections include a future, monthly and daily log. Migration is the system you use to handle an incomplete task. You can move that task to another time frame or cross it off your list because it’s not important enough to be taking up your time. 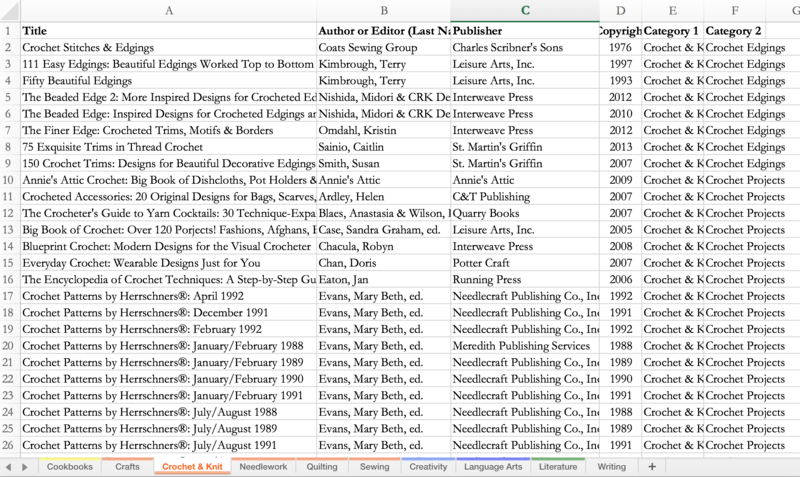 Indexing is how you keep track of your collections with titles and page numbers. Ryder’s short video below explains these concepts much better than I can. 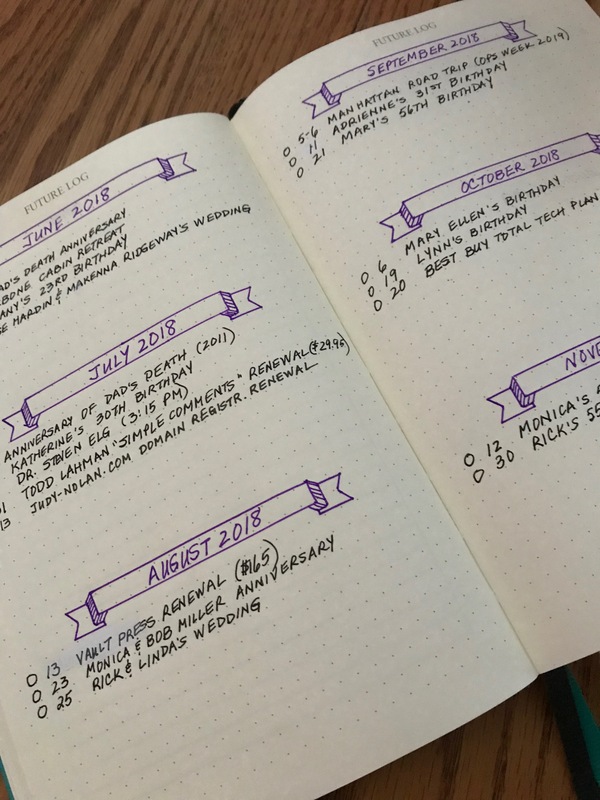 What’s unique about the bullet journal versus other planners is that you can make the journal whatever you want it to be. There are no pre-printed templates you must complete, but instead blank pages you’ll design yourself, using a system that combines substance with minimalism. Ryder’s goal is for you to save time for what’s really important to you. You won’t throw your hands up into the air in frustration because the system you didn’t design is too complicated to maintain, or because you have to follow rules that make you itch like a sweater whose fibers give you hives. Expensive supplies are a thing of the past because all you need are a notebook and pen. Skip, if you like, stickers and washi tape, color markers, charms, fancy paper clips, colored staples, adhesive notes, page tabs or other embellishments. Of course, you can include these items, too—your choice. In other words, you can design your journal to look however you wish. Need a traditional calendar? Grab your ruler and draw it. 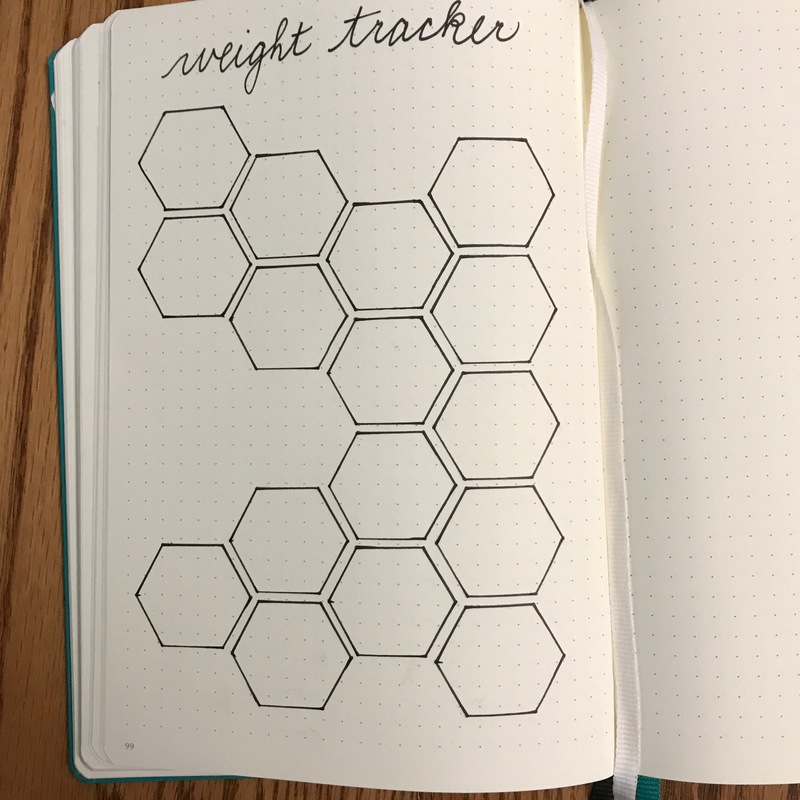 Need a weight tracker? Design or borrow a design from Pinterest. Are you an avid quote collector? Pick a page and start a list. You can purchase designs you can paste into your notebook, too—why not? 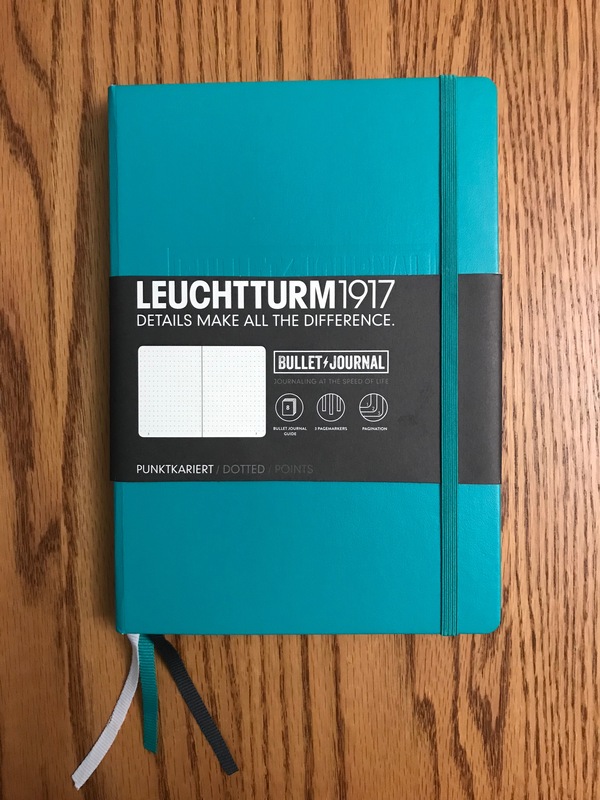 I debated using one of the many blank journals I already own, but in the end decided to purchase the official Leuchtturm1917 A5 notebook to see how it works. Thus far I have discovered that it meets my needs. As advertised, most of the pages in the notebook are filled with a dot grid. 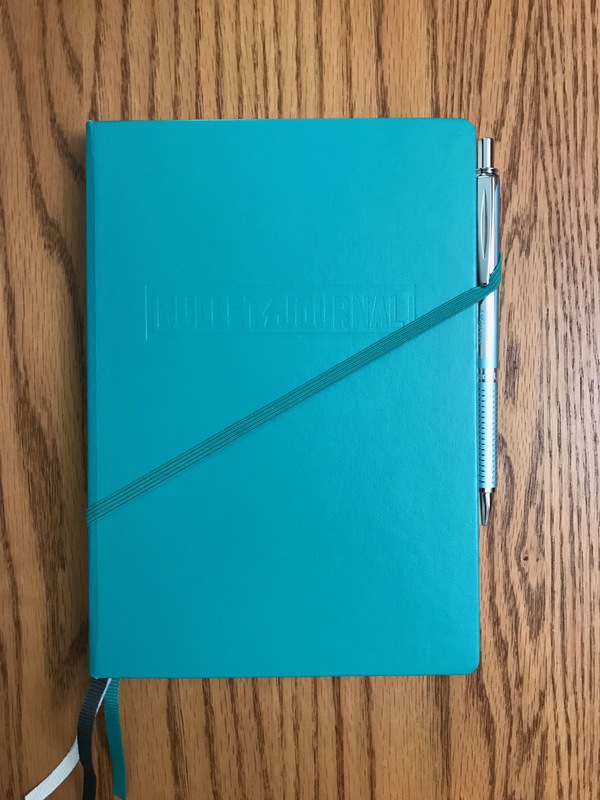 What makes the official bullet journal different from other planners or journals on the market are the following elements. The inside front page contains a symbol key for different types of bullets, with space for you to create your own symbols. A task, for example, is represented by a dot; a completed task is an X, and a migrated task (a task moved to a different time frame) is a “greater than” sign. An index of four pages starts off the notebook with space for you to enter the title and page numbers of the collections inside the journal. All 240 writable pages in the journal, beginning with the future log, are numbered so that you can refer to them in the index. The future log is pre-labeled to encourage you to use it. The intent of these pages is to remind you of items scheduled far in advance. Most people organize their future log into months as shown below. There are three ribbon bookmarks you can use however you wish. 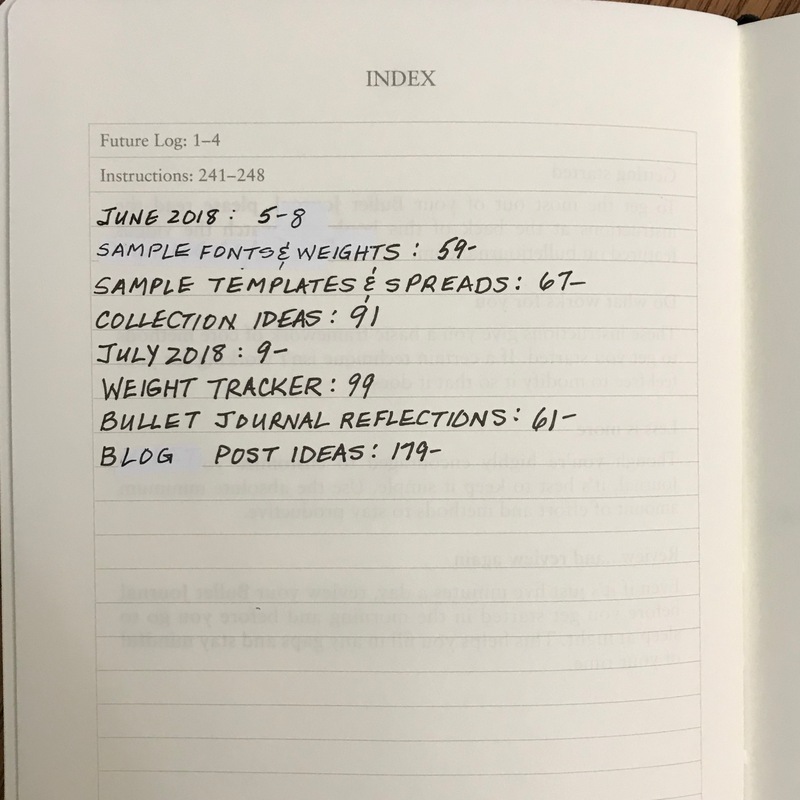 The back pages of the journal contain handy instructions for using the bullet journal system. The outside back cover contains an envelope for you to store anything you wish. I store stencils and the spine-and-cover labels included with the Leuchtturm1917 notebook. If you’re just getting started or are thinking about delving into bullet journaling, below are some lessons I have learned. Even if you’re not sure what you’re doing when you begin your journal, dig in. You’ll figure out quickly what works for you and what does not. Resist the temptation to tear out pages that aren’t perfect. Everything you write is a lesson learned. Create a collection of pages where you reflect on your bullet journaling experiences. Color is nice, but absolutely not necessary. Choose a smooth writing pen that won’t bleed through the paper. I use a set of Staedtler Pigment Liners that have different tip widths: 0.1 mm, 0.3 mm, 0.5 mm and 0.7 mm. I bought mine for $14.99 at Office Depot in a plastic case that stands up for convenience; you can probably find these pens on Amazon.com as well, so I have included that link in this paragraph. Aim for simplicity—if your page designs or methods are too complex, you’re unlikely to use your journal. Migrate tasks weekly and monthly unless they are time-sensitive. Give yourself time to reflect on what tasks unduly occupy your time when something else would be a better use of that resource. Create a collection of sample spreads so you can experiment with different designs. When I entered “minimalist bullet journal” in my Web browser, all sorts of options popped up for me to explore. It doesn’t matter what notebook you use, as long as it meets your needs. Do look for good quality paper. Smooth paper of a good weight will encourage you to open that journal and fill the pages. Don’t be daunted by the 240 pages inside a Leuchtturm1917 bullet journal. At first I feared I’d never fill them; now I fear I won’t have enough pages. 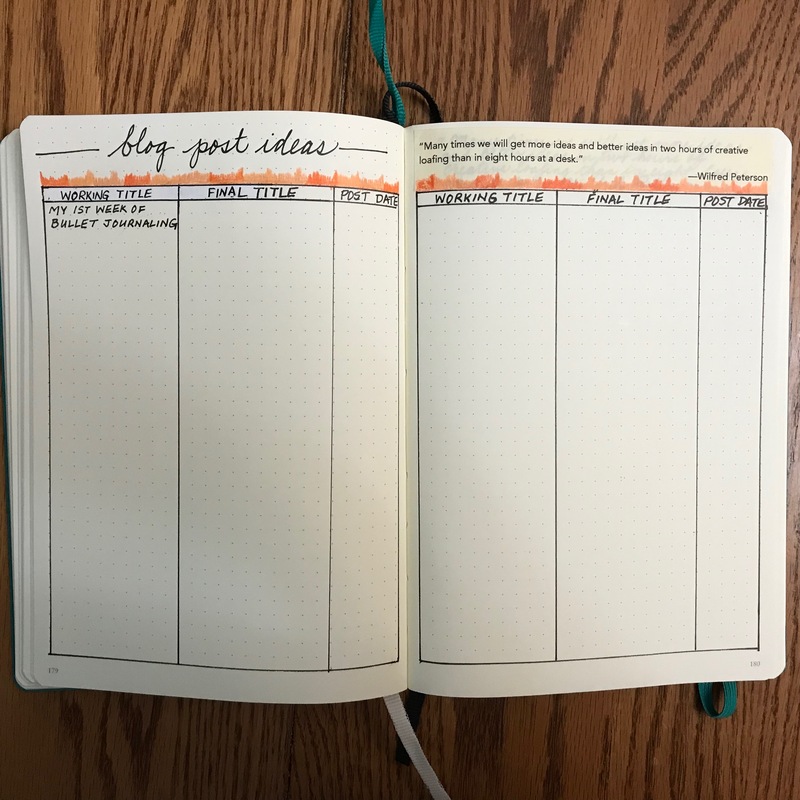 As you learn more about bullet journaling, you’ll come up with more ideas than you might imagine for those blank pages. Nothing is set in stone. If what works for you today doesn’t work tomorrow, try something else. I’ll repeat what I said previously: resist the temptation to tear our imperfect pages. I started off with a daily log that was just a list, separated by dates. 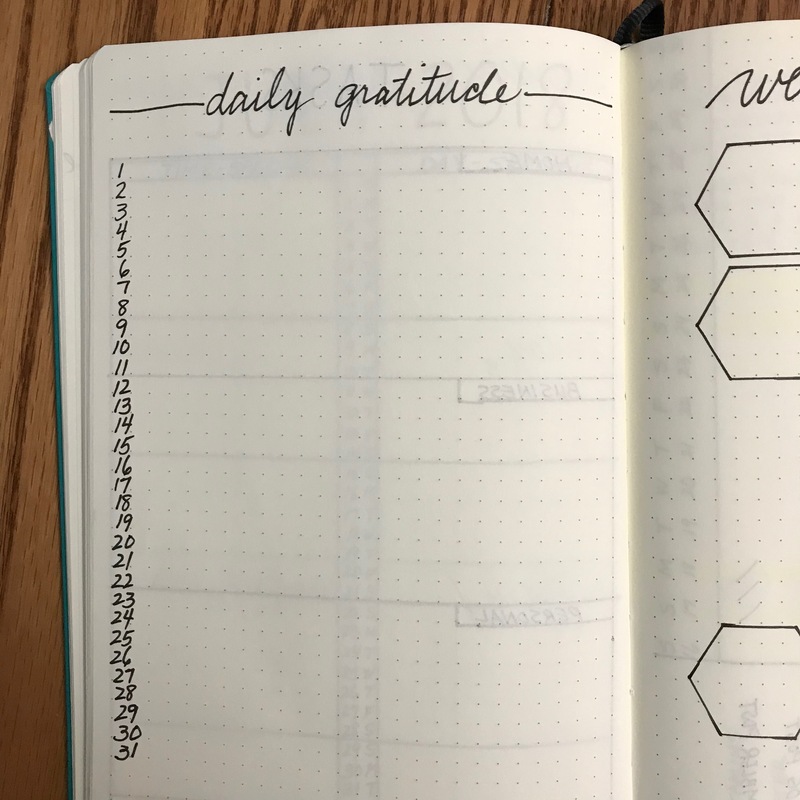 I didn’t like how it looked, so I switched to a two-page spread with defined spaces for each day, so I can see the entire week at a glance. I didn’t toss the other pages, however. For me, what makes a bullet journal special is how easily you can customize it to reflect who you are. 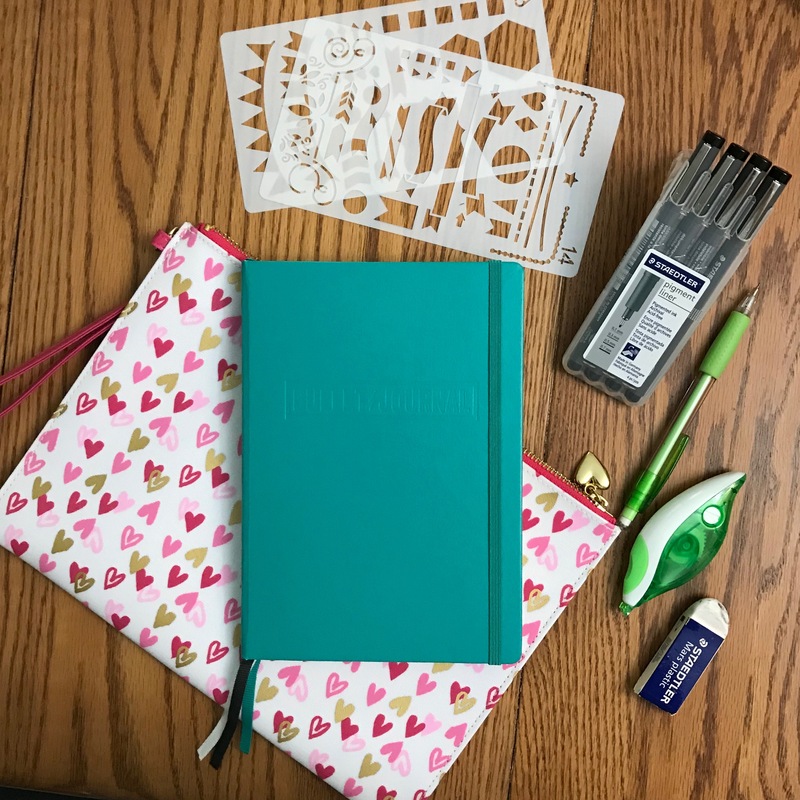 Whether you like to doodle, sketch, write long journal entries, organize or collect lists, you can use your bullet journal for any or all of these purposes. I like to collect quotes, so I include one at the top of the second page of my weekly spread. I have another collection for blog post ideas that includes a working title, a final title and a post date. Some people like to call their bullet journal their brain dump space, but I like to think of it as a parking lot for all of my stray ideas, sticky notes and even my digital notes. At my daytime job, I use Microsoft OneNote as my main organizing tool, but an analog bullet journal appeals to me because it feels more creative. Below are some of the ways I have begun to use my bullet journal. Watch for a future post that includes some other ideas. 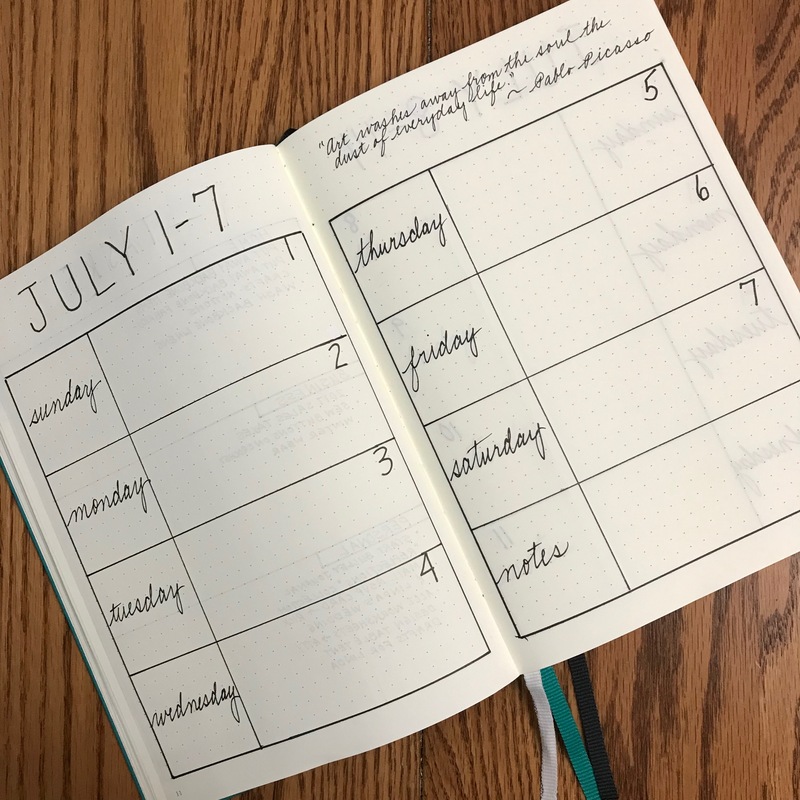 Have you ever used a bullet journal? If so, what made you choose this type of journaling? If not, describe how it might or might not meet your needs. I’ve concluded that librarians, or at the very least, library clerks, are athletes in disguise. This weekend, as I was organizing my craft, needlework and sewing books, I rediscovered muscles I didn’t know I owned. Stacks of books moved from the floor to a bookcase, from the bottom shelf of one bookcase to the top shelf of an adjacent bookcase, and from left to right on one shelf after another. Needless to say, I knelt, stretched, stooped and lifted countless times. After swallowing some water and two Advil tablets, I promised myself once again not to let too many books collect in impressive stacks on the floor—or on any available horizontal surface—before returning them to their proper space on the bookshelf. Unfortunately, this is a promise I keep making and breaking. All I can say with certainty is that it’s a lot of work keeping a home library organized that probably rivals the collection at my local library. As you look at the photo above, you may notice what appear to be dividers peeking out between groups of books. I got the idea at my local library, when I noticed they used plastic labeled dividers to subdivide some categories of books, making them easier to locate. I love this system. 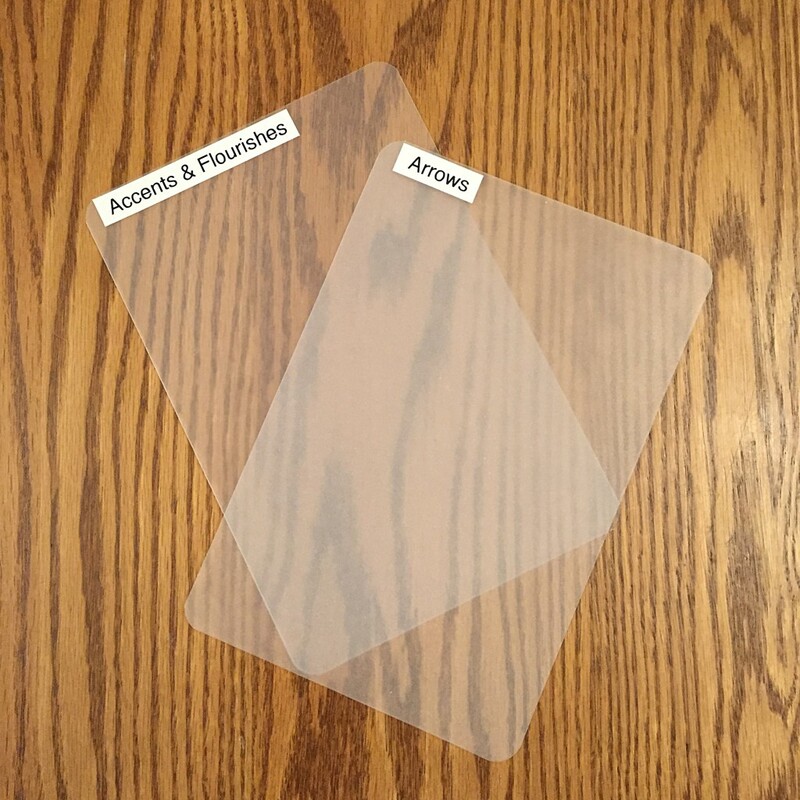 I labeled 8-1/2 x 11 sheets of white card stock and inserted them in clear sheet protectors, and it works great. No, I don’t use a Dewey Decimal system, although I seriously considered it at one point. Upon further consideration and the plea of “No, please don’t do that” from my husband, I came up with an alternate system that works for me. If you, too, are overwhelmed by the books in your collection, here are a few tips that may make your life easier. 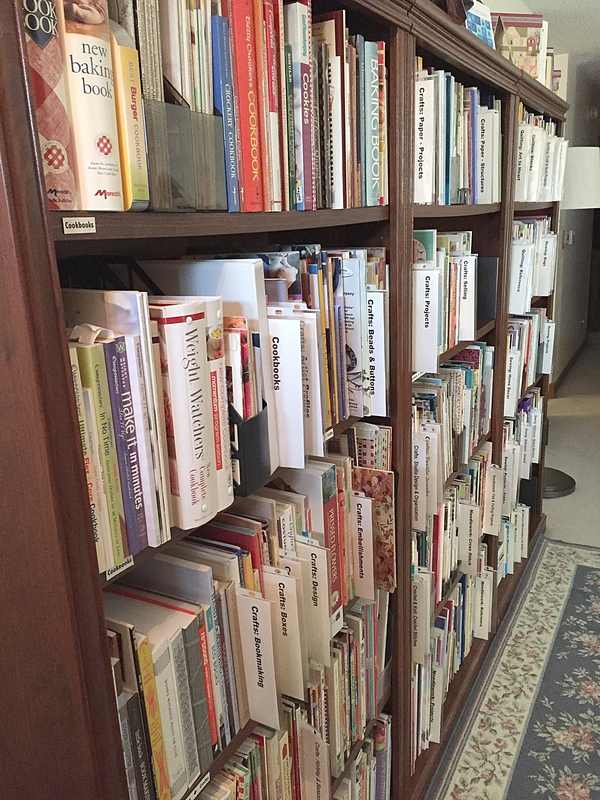 It isn’t enough, if you have a large collection of books, to keep them organized on shelves. Keep a list, whether you use a program like Microsoft Excel or iWork Numbers, or catalog your books using Library Thing or Goodreads. 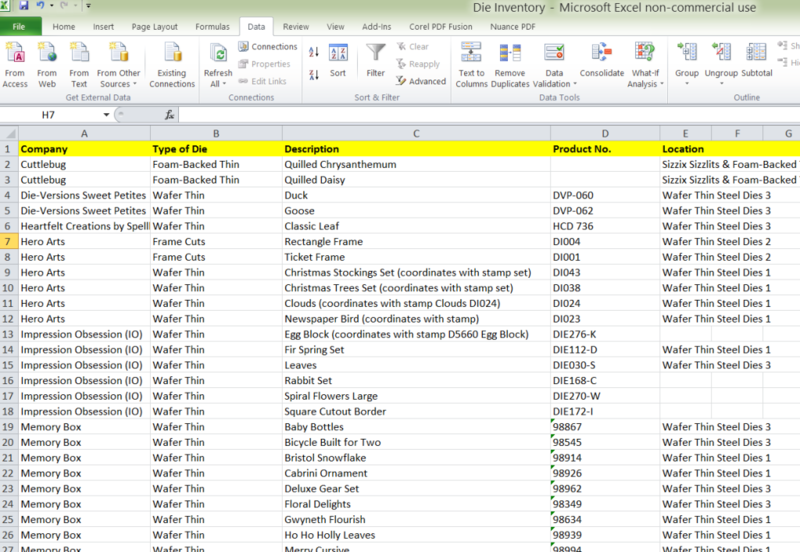 For myself, I find it convenient to use an Excel workbook. This helps me track the books I own, and to some extent helps prevent me from purchasing duplicate titles if I remember to check my workbook before I go shopping. (This is a key point.) It also is a great way to determine actual book placement on my shelves. Within the workbook, individual worksheets are dedicated to each type of book. One of the columns contains an identifier that represents a subcategory, and these subcategories directly relate to the shelf dividers I use. For each book, I enter the book’s title, author or editor, publisher, copyright date, main category, and subcategory. It sounds like a lot of work, I know, but you can enter a surprising amount of information while you enjoy a hot chocolate. What’s nice, too, is that you can sort this information according to your needs. I also find that it’s a good way to weed out outdated titles, especially when you take a good, hard look at some of the copyright dates. Many craft magazines cost as much as the books you buy, and thus deserve a neat method of storage for the time you keep them. I don’t keep my magazines forever, mind you. I keep about two years’ worth of magazines, then remove the articles I find especially useful by slicing them out and scanning them. These digitized copies are, of course, for my personal use, and never get shared. I keep some of the illustrations to make bookmarks or gift tags that become giveaways. Then I put what’s left of the magazines in a recycle bin, and that’s the end of that. Some magazines do get passed on to other people or organizations for their enjoyment. But while I am storing the magazines, I keep them in magazine racks you can purchase from your local office supply store. As a writer, bookaholic, avid reader, and—yes, I admit it—once upon a time English major, I know how hard it is to get rid of books. But if you don’t, you simply won’t have space for new ones. We don’t want that to happen, do we? Your home is only so large. I have 14 bookcases that stand six feet tall—many more shelves of space than the average person, I know—but I continually run out of book space. And some of those bookcases are used not for books, but for craft supplies. These days, I don’t add many hardcover fiction books to my shelves, unless they are part of a series I have already begun in that fashion, or if they are such long novels that I have to page back to earlier chapters to look up some details. The rest of my new fiction novels are in digital form. 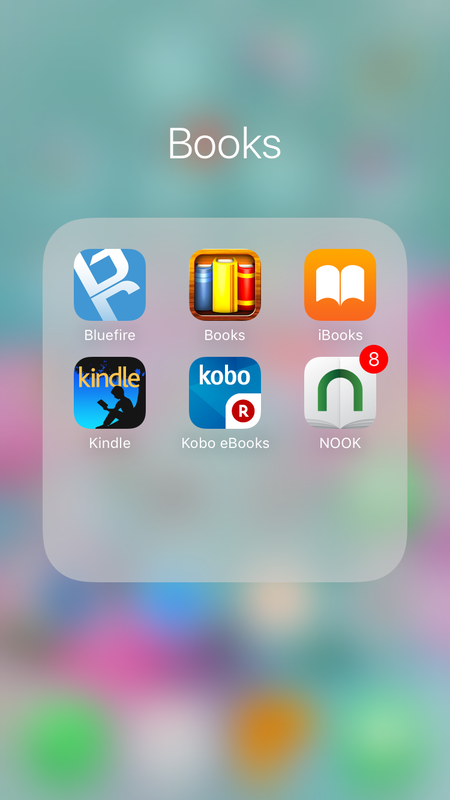 I save a lot of bookshelf space by utilizing book apps on both my iPhone and iPad—among them iBooks, Nook, Kindle, Kobo, Free Books by Digital Press Publishing, and Bluefire Reader. You can donate books to your local library, which will often sell them and use the monies to purchase new books. You can also donate books to senior communities, nursing homes, schools and thrift stores. You can sell some books to a bookstore—I use Half Price books, for example—or you can sell books on Amazon. You can exchange your read books for new titles via a book swap service—I use Paperback Swap, for instance. 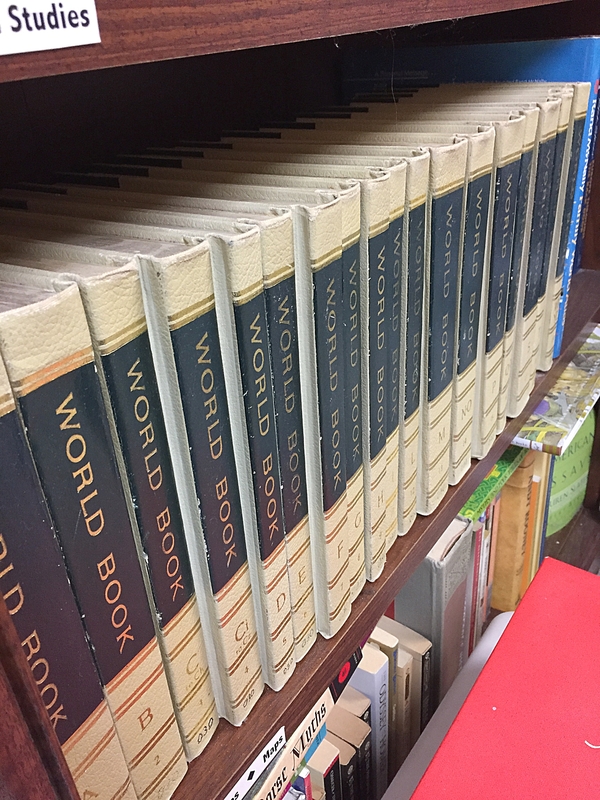 I finally thought with my head more than my heart, and decided to get rid of a set of World Book encyclopedias dating back to 1969. The white leather-bound, gold-edged volumes have long held a special place in my heart and on my shelves because I won them during junior high when I sent in a question to the “Ask Andy” column in the Milwaukee Journal. At that time school children were routinely invited to send in their seriously considered questions. Each week one question would be selected and answered by “Andy,” and the student received a complete set of “Aristocrat” World Book encyclopedias. I asked what the real job of a nurse was—a career I considered at one point but decided against. My question was selected, and I received a set of encyclopedias. It was a great prize, but in 2016 these encyclopedias are seriously outdated. Anything I want to know of a general nature can be found online in spades. Time to donate! The space I recover will be used for my books about writing, to which I refer far more often than the World Book encyclopedias that are moving on. I cannot state strongly enough how important it is to leave breathing room on your shelves for new books. If you’ve ever looked at home decorating magazines, you’ll notice that expansion space is provided with decorative bookends, vases, knickknacks and photo frames. That being said, I have no room for anything but books on my shelves. I love the decorator look, but need to think about functionality more than home dec because of the sheer volume of books I own. I do, however, take care not to squeeze books in so tightly that you can’t add a few new ones. If your cuticles begin bleeding when you insert or remove books, that’s a sure sign you’ve squeezed in too many titles. Locate the sturdiest shelves you can find, or make them yourself. A poorly made bookcase typically has shelves that bow as you add books. Ideally, bookshelves should measure at least one inch thick. Bookcases don’t have to be expensive, but they do have to be strong. If you’re fortunate enough to live near an IKEA store, you can purchase a set of sturdy, functional shelves you can assemble yourself. I don’t live near an IKEA store, so I ordered bookcases through my office supply store’s catalog service. They shipped the shelves directly to my home, and my husband assembled them. If you have additional suggestions for organizing your home library, I’d love to hear them. Meanwhile, I will return to my own library and finish organizing its contents. Full disclosure: Yes, I have worked in a library, and I seriously considered going into library science. If we can avoid it, most of us prefer not to re-do our craft storage systems. We’d rather use that time for crafting! 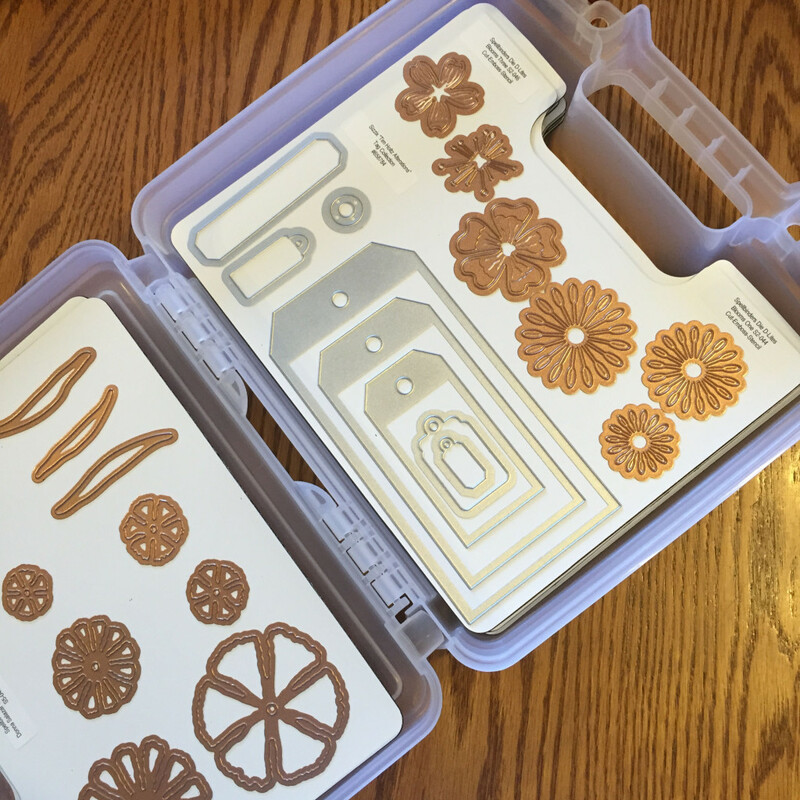 I’m no different—when I originally stored my wafer-thin steel dies and foam-backed dies inside a combination of three-ring binders and plastic storage boxes (see How to store your wafer-thin cutting dies), I felt pretty good about both systems. The binders I use for my thin foam-backed dies still work just fine, as this collection is not too large. But my collection of thin steel dies is immense, making it difficult to locate the one I need in a snap. I tried to solve this issue by developing a spreadsheet with a “Location” column (see Create a master inventory system for your cutting dies), but while this has helped me to locate the box or binder where dies are stored, it doesn’t allow me to zoom in on the exact location for dies stored in plastic boxes. I find myself paging through randomly stored magnetic sheets until I find the correct one. This can sometimes take quite a while. In the end, I decided to adopt the wafer thin steel die storage system recommended by Jennifer of Jennifer McGuire Ink in her Craft Organization and Storage videos, among them Die Storage from 2013, and Staying Organized (Stamps, Dies and More) from 2015. 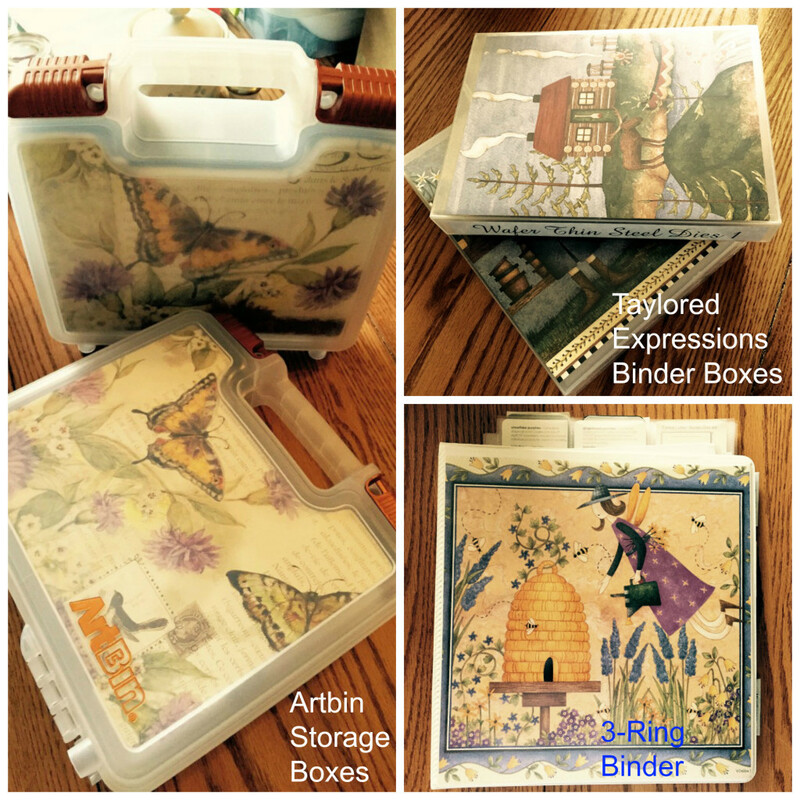 Jennifer stores her dies upright in a combination of square 5×5 CD sleeves, 5×8 or 6×9 job ticket holders, and 5-5/8 x 7-3/8 inch Avery Elle Stamp & Die Storage Pockets. 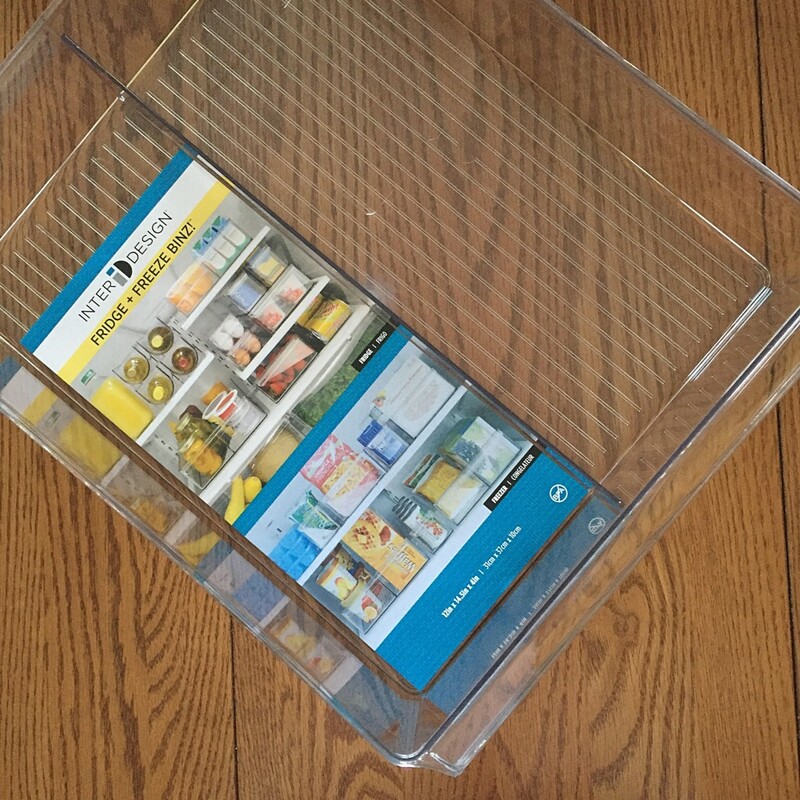 The pockets are then stacked, one behind the other, inside clear, sturdy InterDesign refrigerator bins you can purchase online or at your local Bed Bath & Beyond store in the kitchen storage section. This makes all dies easily visible and quick to find. The bins are portable, so you can store them on an open shelf or carry them to your worktable. Dies are separated into categories and identified with labeled dividers, and each die pocket is labeled, too. For the most part, I am using Avery Elle clear protective pockets as shown below. When I decided to adopt Jennifer’s system, I adapted a couple of elements to suit myself. 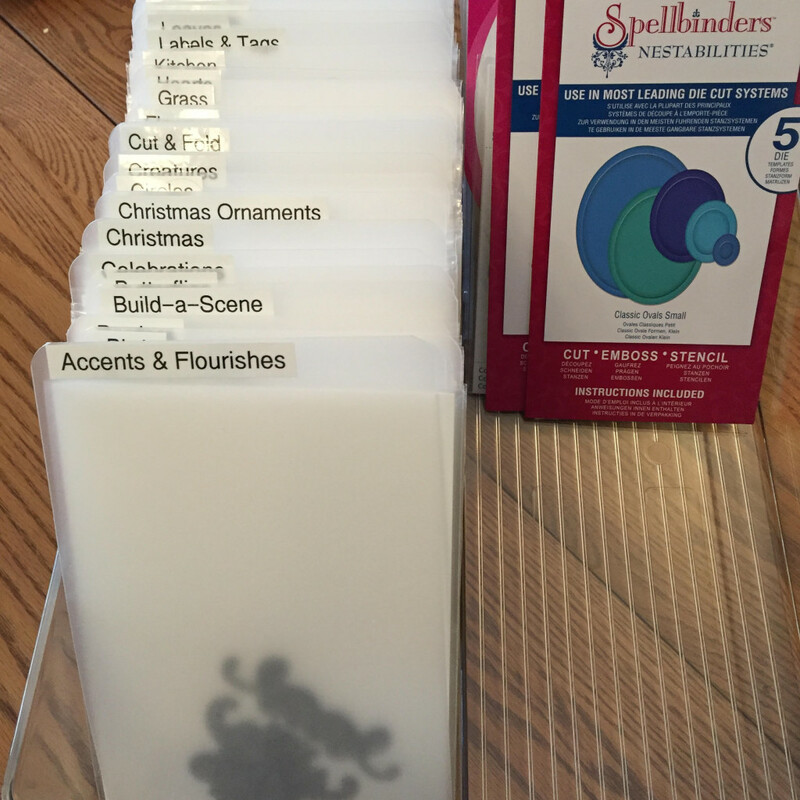 First of all, Jennifer uses inexpensive colored vinyl folders to use as category dividers. She cuts them to size, rounds the corners, and tosses the leftover folder bits. 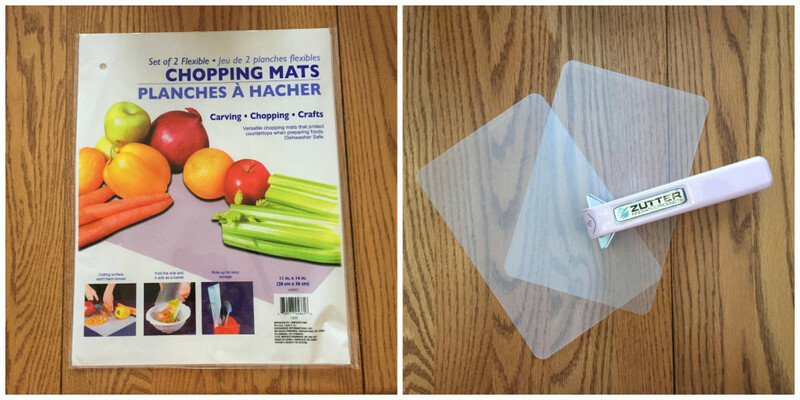 I decided to use white kitchen cutting mats you can purchase from your local Dollar Store or online, and cut them to size in the same way that Jennifer does. 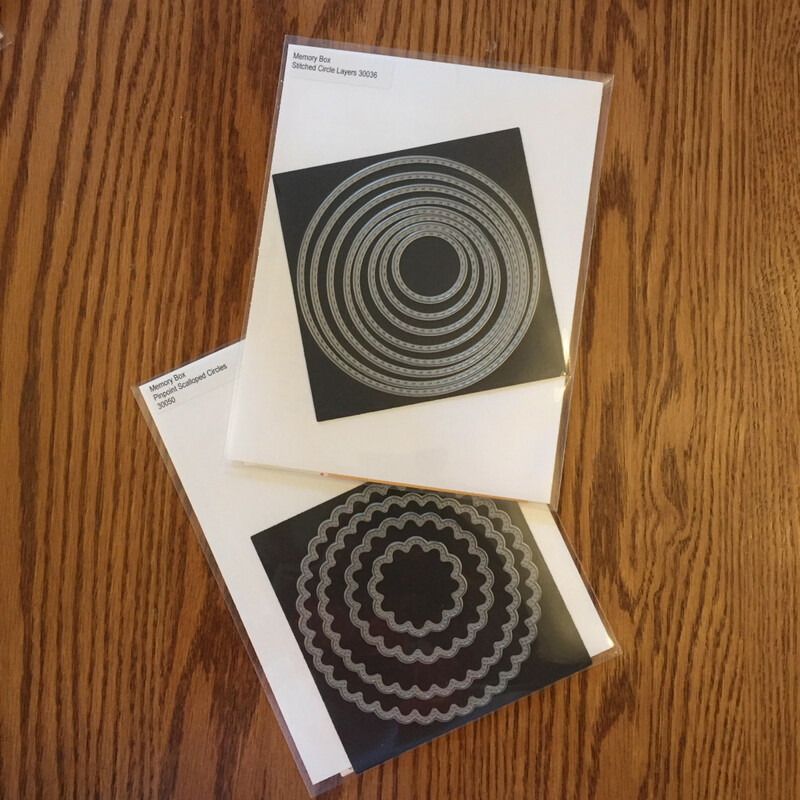 The difference, I think, is mainly that your dividers will be white, and they may be cheaper to buy as a package of two cutting mats for one dollar than they would be if purchased as individual vinyl folders. On the other hand, if you prefer colored dividers, visit your local office supply store and purchase colored vinyl folders or vinyl index page dividers. 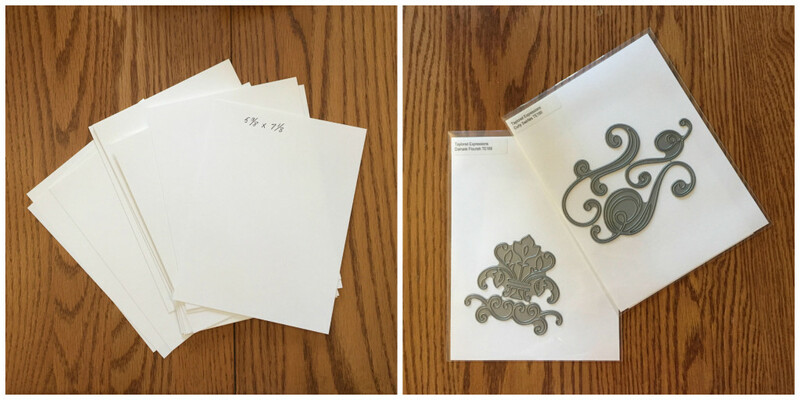 Whether you use vinyl folders, pre-cut dividers (that you still have to trim), or vinyl cutting mats, they are all about equal in weight and sturdiness. Jennifer uses a Brother label maker to label all of her category dividers and clear protective pockets. 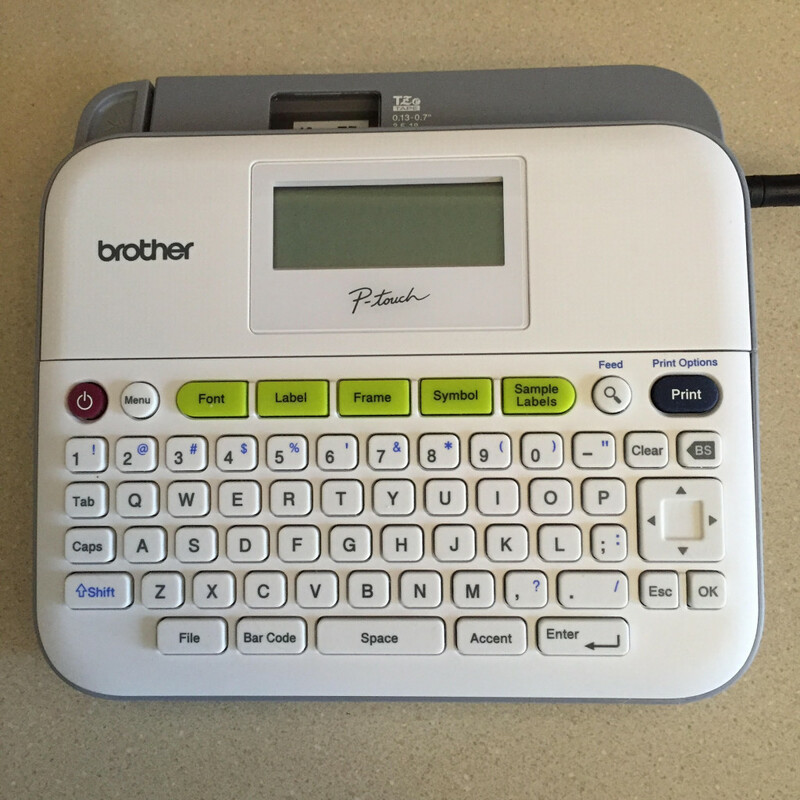 I own a Brother PT-D400 Label Maker, not the same model as Jennifer’s, but mine works pretty much the same as hers. If you purchase one, make sure you purchase an adapter with it, as it will save you the dollars you would otherwise spend on batteries. If you have a Brother label maker or are thinking about getting one, I highly recommend you watch Jennifer’s video, My Favorite Crafty Things: Organization from 2015 (advance the video to 8:08), where she provides tips for how to conserve your labeling tape. The label maker has a feature called “chain print” that allows you to print multiple labels closely together, instead of advancing the tape an inch or more after every label. 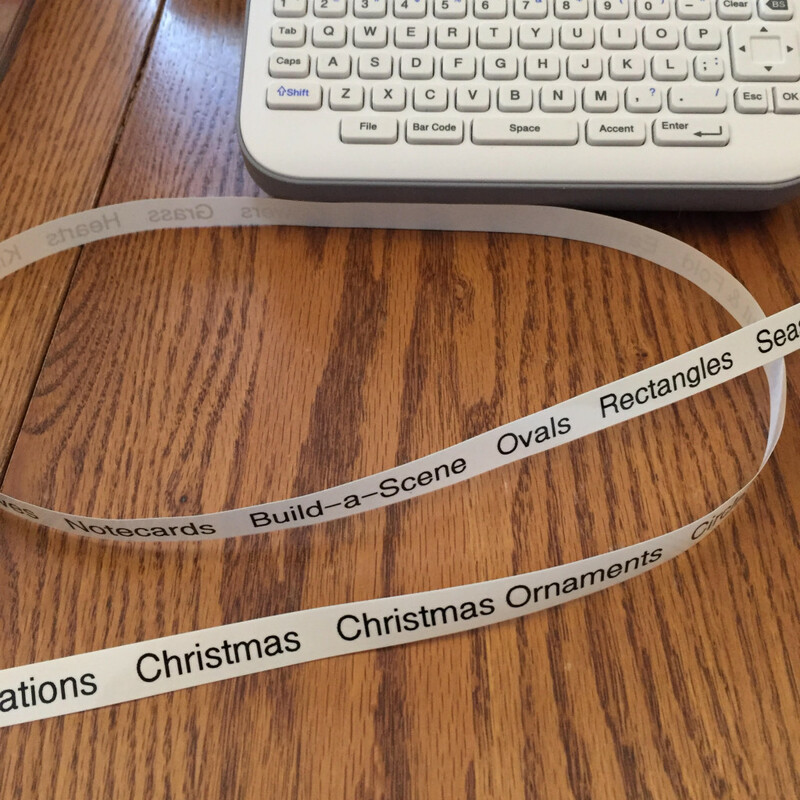 After all of your labels are printed, you can snip the tape between labels with a pair of scissors. 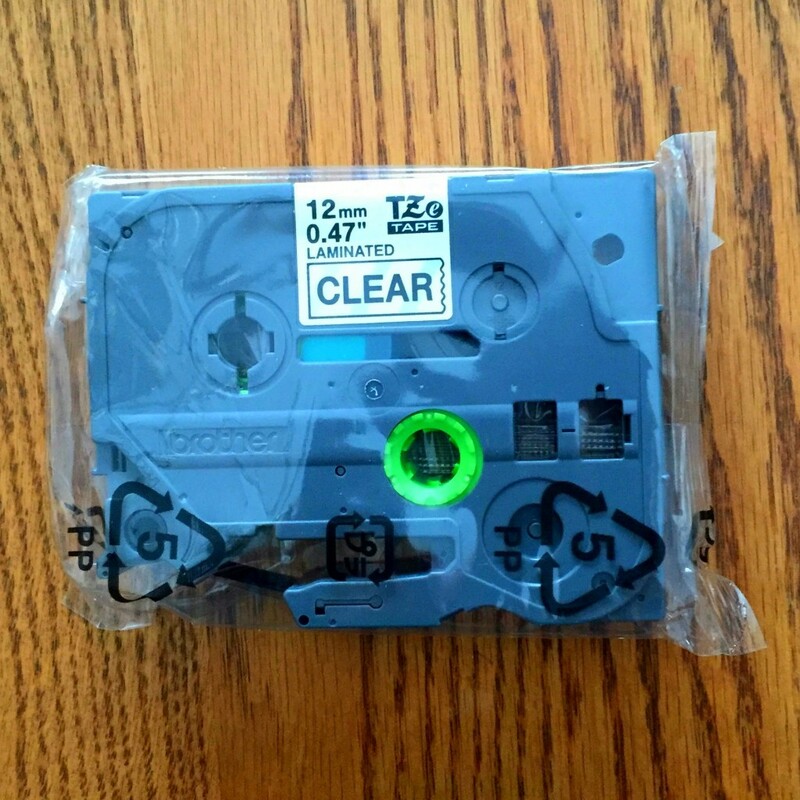 The tapes, which do work well, have one drawback—they are rather expensive. If I buy labeling tape from my local office supply store, it costs $18.99 for 26.2 feet, so I look for a coupon first. Otherwise, I search online for the best deal, such as Amazon, where the last time I checked the cost was $9.66. Quite a difference! Jennifer uses labeling tape for just about everything in her craft room. So far, in regard to die storage, I only use it for my category dividers. For my clear protective pockets, I use Avery Laser Labels 5267. Please note that these labels work for both laser and inkjet printers. The labels are compact, measuring ½ inch by 1-3/4 inches, and come 80 labels to a sheet. I use Arial Narrow in a 10-point font to identify the die’s manufacturer, design and item number. I discovered one drawback to these labels: they peel off the clear protective pockets as quickly as you adhere them. The solution is easy. 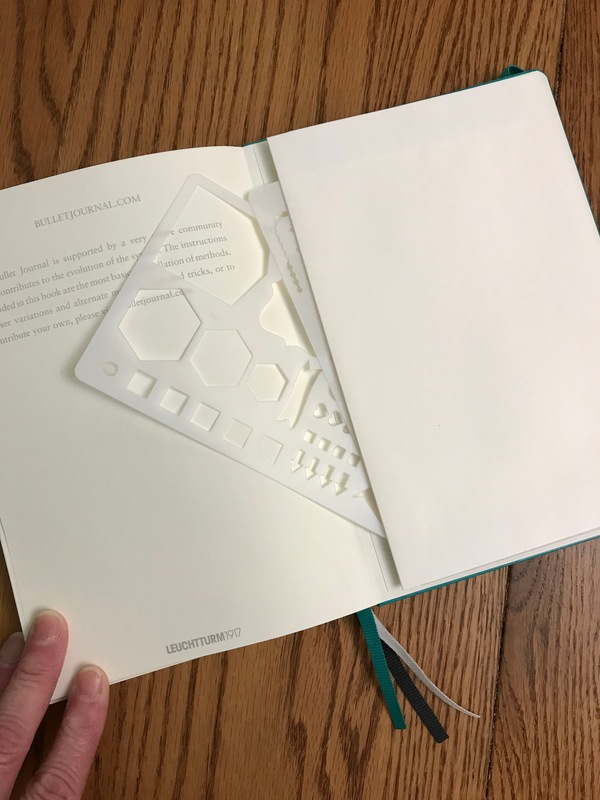 I insert a rectangle of white card stock inside each pocket to make the die visible, but also to provide a place for special instructions or a matching stamp. I insert the die in front of the card stock insert, and other items behind it. 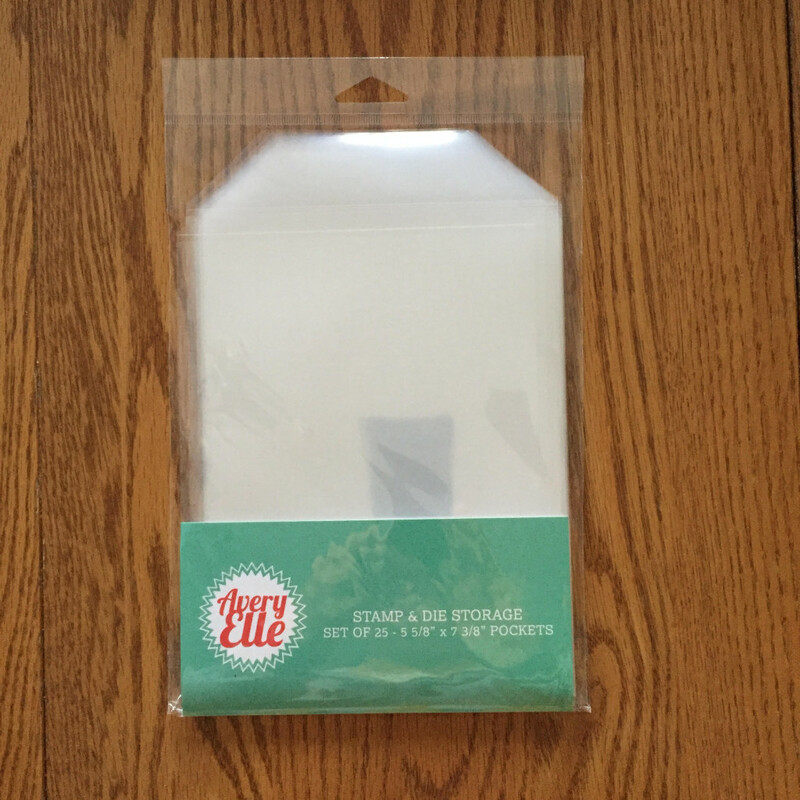 Instead of adhering the Avery label to the pocket, I stick it to the card stock insert. This system is much faster than using a label maker because you can type and print many labels in a jiffy. I save the file for these completed labels from one typing session to another so that I know where the next label is located. I simply highlight the new labels and print that selection. I have not completed my new die storage system, but as you can see, a refrigerator bin storage system holds many dies. In the photo below you see more than 90 dies, and there is space for many more. 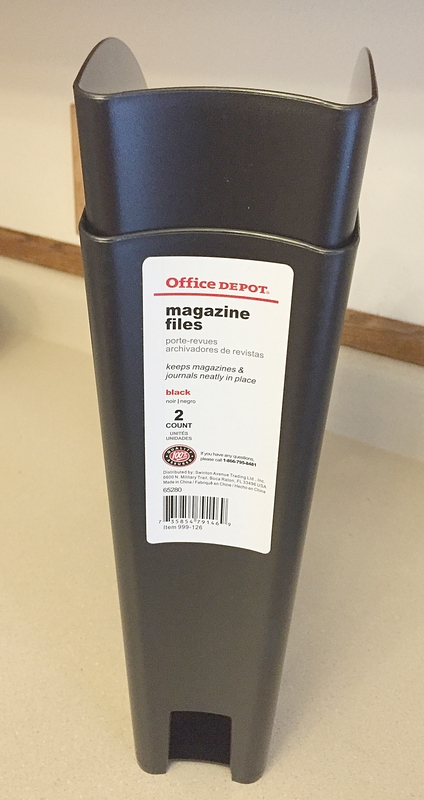 When not in use, I store the bin on a bookshelf. Otherwise, I simply move it to my craft table. One storage bin accommodates hundreds of dies. In contrast, my previous plastic box system stored fewer than half of my dies and took up four boxes. You might be wondering what I will do with my old plastic die boxes. To be honest, I am still thinking about alternate uses; if you have suggestions, let me know in the comments below. I may sell them for $5 apiece, plus shipping. If you’re interested, you can email me at judynolan@aol.com. But the magnetic sheets inside them are being cut up, as needed, to accommodate layered sets of dies inside the pockets for the new system. Of course, some dies already come with magnetic sheets. If you have a boatload of wafer thin steel cutting dies, what storage system works best for you?